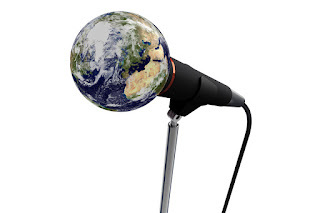 As far as they can tell, Word Sprout’s monthly open mic The Not-So-Silent Planet is the only speculative fiction open mic in the country ("perhaps the world!") But just in case you didn’t catch their act before now at Kieran’s Irish Pub, they put together a sampling of three of their odd-ball greatest hits intercut together in a Fringe show to tease your mind and senses. I wasn’t entirely sure what to expect, but with Phillip Andrew Bennett Low curating and directing the show (and Allison Broeren producing), I figured we were in good hands. All three stories were very different flights of fancy from one another, and all of them were mind-bendingly strange and fun. With live music backup keyed to each of the three stories from Jonah The Destroyer (no, really), each storyteller took the stage in their own way. Gary Simmie Hoover would wander pensively in a large circle around the space. Pat Harrigan read from his story on a music stand that he turned to face each side of the audience at regular intervals. Tom Wick was performing across various pools of light and with the voiceover help of Angela Fox as the spaceship’s computer. Hoover told a tale of gods and goddesses entering our world through back alleys and masquerading as homeless people. A wandering mystic observes the God of most Christian faiths in failing health and beset by Lucifer. As the mystic gets pulled through various planes of existence, he sees the earth being quarantined by concerned supernaturals, and God’s former paramour coming to his aid. Harrigan recounted the travails of a trio of immortals, at odds with one another across the ages. They dealt with the ups and downs of humanity, and the logistics of navigating a world in which civilizations come and go but you never age. And even the devil has an expiration date. Wick took us into outer space, where the commander of a long-term space mission to answer the distress call of an alien race hundreds of years from Earth finds more than their share of surprises when they reach their destination. Watch out for the last line of this one. Each story is split into thirds, all beginning and ending in fascinating places. They burrow into your mind and keep you thinking about them long after they’re done. The Not-So-Silent Planet is a great Fringe show, and a great showcase for the concept. And the best news is, if you want more, it’s happening every month between now and Fringe 2017. Enjoy!